After being at Blogalicious and the Natural Star Natural Hair Expo, I am beginning to realize that there are times in my life where I am constantly on the go. When I am on the go, I need a simple way to keep my energy level boosted. I typically make sure to drink water and take a multivitamin. Although that often keeps my energy level boosted, sometimes I need an extra push to make it through the day. 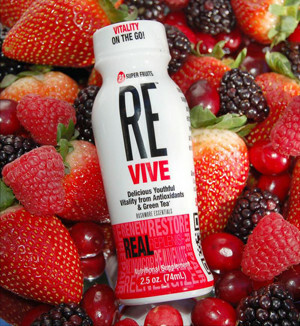 With this in mind, I'm glad to be reviewing REvive Vitality Drink. What is REvive? We're going to break it down and give you a chance to try it in this post! What are you looking for? REal ingredients and REal benefits without depletion or jitters. Done. What do you want out of it? A product that you feel now, but that also has long term benefits. Check. What else? Healthy nutrition, antioxidants, 21 super fruits, natural stamina & focus, REally, REally great taste, no preservatives, no added sugar, and 100% juice & puree? I enjoyed trying REvive. As someone who often needs an energy boost throughout the last two hours of work, this came in handy. Plus, I really enjoyed the small bottle, which was convenient to throw in my purse. Although the color of the drink was brownish, it tasted great. It did give me a small boost in energy, but not anything over the top. This is the perfect drink for someone who is looking for a way to incorporate fruits into their diet and receive an extra boost. Yes. I enjoyed the taste and it's very affordable. I love the fact that you can get an 18 count package for under $30. There will be five winners. Must complete the one mandatory requirement. Giveaway is open October 21 until midnight, October 28. Don't want to wait to try REvive? You can redeem a $1 coupon to try it now! Plus, $0.25 of each coupon redeemed will be donated to Boarding with Breast Cancer. Click here for the coupon. yummm! I wanna try this! I definitely think you'll like it! Thanks for entering! Don't forget you can tweet each day to win! I know you need it then! LOL. Thanks for entering! Don't forget you can tweet each day to win! I would SO love to try this delicious goodness! I would definitely like to try this to see if it would give me a boost of energy first thing in the morning at work.